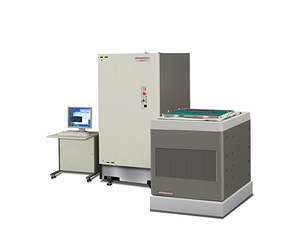 TOKYO, JAPAN--(Marketwired - Jan 14, 2014) - Leading semiconductor test equipment supplier Advantest Corporation (TSE: 6857) (NYSE: ATE) announced today that Denso Corporation has selected its T2000 Integrated Power Device Test Solution (IPS) for automotive device evaluation and production testing. Denso will use the IPS to evaluate and manufacture control, power-train and sensor devices for automobiles. Advances in automotive technologies to improve fuel efficiency and reduce CO2 emissions, as well as the development of advanced safety technologies, have diversified automotive semiconductor needs and driven demand for higher production volumes. Suppliers and users of automotive devices require test environments that contribute to shorter development times, accelerate production ramps and allow production volumes to be expanded with minimal capital investment. Simultaneously, to enable testing of silicon-on-insulator (SOI) based, bipolar-CMOS-DMOS (BCD) processed mixed-signal devices, which are widely used in the automotive industry, test solutions must support high-speed digital interfaces -- whose speeds continue to increase -- in addition to high-precision analog semiconductor technologies. Advantest's T2000 IPS satisfies these needs with industry-leading test quality and cost efficiencies. Denso's decision to install the T2000 reflects the superior test quality provided by Advantest, the IPS's support for diverse automotive mixed-signal devices and its multi-pin device parallel-test functionality, among other capabilities that make this a preferred solution for test time and device development time reduction. Denso's executive director in charge of the company's device business, Yukihiro Kato, said, "The T2000 provides broad coverage of high-voltage and high-precision analog devices, including those with very high-speed interfaces. It is contributing to productivity improvements for us." The T2000 IPS is optimal for testing not only automotive devices, but also power-management ICs and power-switch devices. By integrating a range of measurement capabilities into a single module, Advantest is able to compress peripheral circuitry into the smallest possible space and offer best-in-class parallel-test functionality. The use of proprietary circuit technology dramatically reduces wait time, compared to previous systems, while the T2000 platform's high reliability and support for high-voltage, high-precision testing have contributed to its reputation as the leading test system in its category. The adoption of the T2000 by Denso, a premier automotive-parts supplier, further testifies to the system's diverse functionality, scalability and ability to reduce test costs.